I really like those brown pools! 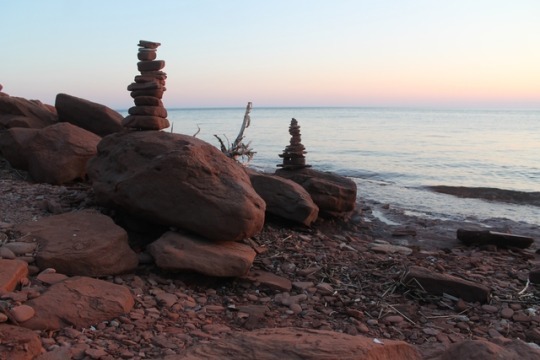 I really like these stone stacks, very creative. Joli dégradé de couleurs pour la roche. It is funny the way fashion travels the globe so quickly now. I am, of course, referring to stone piles. Your red rocks fascinate me, Mary - is the whole of the island coast like that? Mary MacADNski: No, the south shore has more stone while the north shore is entirely sand. I live and love the rocky south shore. Ordered and standing the test of time, Mary! I never tire of the pictures you show us of your coastline. Natural crazy paving, love it! :Looks a bit of a risky descent down to the shore. The pock pillars are very popular.